It won’t have escaped your attention that a sporting event has just kicked off in Russia; 32 teams and 732 players will be watched by billions of fans before one team earns the right to be crowned world champions. We now know the groups, and the roadmap to the final has been plotted out by countless pundits. But who will win? As humans, we love to speculate, debate and anticipate the winners and losers ahead of time. What makes football so appealing is the drama, unpredictability and surprises that unfold in front of our eyes. Who would have predicted the 7-1 hammering Brazil, the pre-tournament favourites, suffered at the hands of Germany in 2014? Results like these are what football fans live for. Despite this, everyone and their dog has an opinion on who is going to win in Russia - so much so that at the last tournament in Brazil, in excess of $1.82 billion was gambled by wannabe football experts. In previous years, we have seen animals take centre stage when predicting the outcome of the tournament. Pigs, cats, donkeys, monkeys, cows, alpacas, dolphins, armadillos - and famously, ‘Paul the Octopus’ who now has a Wikipedia page in over 50 languages - have all been used to predict results. While clairvoyant animals may not really hold the key to predicting sports results, there may be smarter solutions. The best teams aren’t those with the best players, but the best combination of players. Scouts and coaches have used observation, rudimentary data and intuition for decades, but savvy managers are also using insights from advanced analytics to identify stars and undervalued players. In the club version of the game, managers are already using machine learning algorithms to calculate the quality, talent and value of thousands of players. This helps clubs find talent, look for players that fit a certain profile and analyse their opponents. The same logic can be applied to the national version of the game to help managers identify the best combination of players possible ahead of the tournament. The best teams aren’t those with the best players, but the best combination of players. This scientific approach can also be used to predict the winners of the competition. For instance, ahead of Russia, Avaera, powered by SAS Viya, crunched the numbers to combine player data, match data and countless other factors to build a sophisticated data model, that ran multiple simulations of the tournament and ultimately uncovered the front-runner. After running 10,000 iterations of the data the predicted winner was Spain - sad news for all the proud Lions backing the boys in white and red. Although this, of course, preceded Spain sacking their manager just days before the tournament started! Another reason why you need to rerun models multiple times, while constantly updating the data that feeds into it. Ultimately, algorithms, data and machine learning will never fully usurp the need for football managers, coaches and experts – but their decision-making can certainly be improved by using it. Similarly, analytics cannot account for every single eventuality, such as a star striker picking up an injury. But, using tools like SAS Viya, humans can begin to predict the results of games ahead of time using scientific methods as opposed to relying on magical beasts. The beautiful game unites us, and by aggregating knowledge and data generated by the billions of players and fans around the world, we can truly leverage the collective power of crowds, analytical brains, and modern technology to ultimately be smarter together. 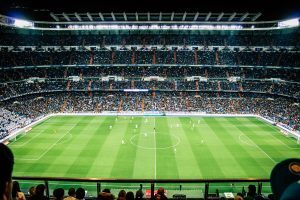 Find out how SciSports is using data analytics to help football clubs find the right players for them. Would the model change if we would remove shootouts for sudden death overtime? Unfortunately not. The model was trained on data taken from various leagues around the world, among other sources, to allow for the most up to date form of players. Accounting for the fluctuating team's selected in the scarce international schedule. Therefore, these games would not have taken into account the possible extra time and penalties that would take place in the World Cup. In hind sight, we probably should have also accounted for the 'VAR effect', which has resulted in an incredibly high amount of penalties being awarded during the tournament!